As the rental market slows and rents drop, more Manhattan university students are finding better deals living off-campus in rental apartments. Citi Habitats sales agent Tim Brassil said that he has definitely seen an uptick in student clientele, especially last month. February is normally a slow time of year for rentals he said, but in late February, he looked at apartments with five different NYU students and their families. Students can often find more space and privacy for less money, brokers said, and the apartments can be more convenient than the units the school offers. There are a lot of students living off campus, whether in their own apartment, with their family or elsewhere. Of New York University’s 38,000 undergraduate and graduate students, 12,000 live in university housing, according to the schools’ 2008-2009 department of housing records. At Columbia University, approximately 70 percent of the 5,300 undergraduate students live in school housing, university spokesman John Tucker said. The New School has 9,390 students enrolled this year, but the university houses just 1,547 students, according to school spokesperson Caroline Oyama, while Marymount Manhattan College enrolls 2,000 students, but only houses 700, the school Web site indicates. Hanna Weitzman, a recent NYU graduate, moved off campus the summer after her sophomore year. She and her roommate moved into a two-bedroom apartment on Houston and Avenue C, where they each paid just over a $1,000 a month in rent, compared to the $1,100 to $1,900 a month for on-campus housing. The school’s accommodations vary from the so-called “low-cost housing,” which usually entails more roommates and less space to the expensive private bedroom suites. Weitzman recently moved from the East Village up to Harlem with two new roommates, where they found an even better deal. Citi Habitats agent Caroline Bass, Weitzman’s agent for the Harlem deal, said her client’s case was not unique. Mark Lynch, an agent at Core Group Marketing, is shifting from selling luxury units to renting apartments to increase business. He’s begun reaching out to students and recent graduates in the hope of cultivating an entirely new class of clients. 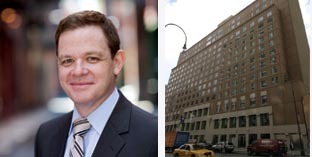 Lynch recently held an informational session for 40 students at one of NYU’s Union Square dorms to talk about the rental market. Lynch noted that the price difference in living off campus can be huge and said he was hopeful he’d hear from many of the students he’d spoken to.